Not even the potential loss of Jason Spezza and Dany Heatley as linemates can get Daniel Alfredsson down this fall. The possibility that Alfredsson could be moved off one of the most offensively explosive lines in the League as new coach Craig Hartsburg tries to find more balance for the Senators has been the biggest story during Ottawa's training camp. "I think we're going to try to be separated," Alfredsson said. "I mean, I think we can always go back. But I think our new coach, Craig Hartsburg, would like us to find more balance throughout the lineup, more balanced scoring. "We're going to try different combinations. We know how well Jason and Dany can play together and, hopefully, I can find a couple good linemates, as well, that can take pressure off them and create offense. If we can do that, I think we can have three lines that can contribute offensively, and that takes pressure off everybody." So, if Alfredsson isn't worried about being tossed off Ottawa's gravy train, what exactly is occupying his thought process as the Senators gear up for the 2008-09 season? The answer is a homecoming beyond his wildest dreams. Alfredsson, the Ottawa captain and a proud Swede, will lead the Senators to Sweden for Bridgestone NHL Premiere 2008, a two-game series in Stockholm against the Eastern Conference champion Pittsburgh Penguins on Oct. 4 and 5. Those games are part of the NHL's season-opening European spectacular to kick off the 2008-09 campaign. 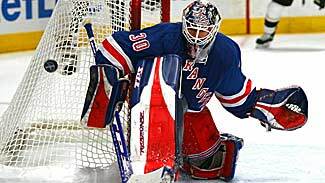 The New York Rangers and new-look Tampa Bay Lightning are playing a two-game series in Prague, as well. And while Alfredsson is excited to play regular-season games in Stockholm, he is over the moon about the Oct. 2 exhibition game against Swedish club Frolunda, Otttawa's final tune-up before arriving in Stockholm. The game will take place in Gothenburg, Alfredsson's hometown, against his childhood team. Alfredsson came of age in the Frolunda youth system and played there before reporting to Ottawa 13 years ago. "It's going to be a really great experience for myself, I think, coming home to my hometown and then, obviously, to Stockholm," said Alfredsson. "Like I said, the media follows the NHL pretty closely, but to be able to show off ourselves in front of them, I think it's going to be special. "You know, it's not a home game in the sense that, you know, we play there regularly. But at the same time, it's my home and I played a lot of games in Stockholm, in the Swedish League. So, there are a lot of memories that are involved." Memories Alfredsson thought he would never be able to revisit while wearing an Ottawa Senator sweater. "I thought for sure I wouldn't be able to go back and relive it. But this is a great opportunity to do that. You know, playing in front of Swedish fans, it's definitely something I'm looking forward to." And Swedish fans can't wait to see Alfredsson, especially in Gothenburg where he is one of the favorite sons in an intensely proud hockey city. Ulf Dahlen, the first-year coach of the Indians, played most of his career in the NHL, like Alfredsson. He knows how special it is to Gothenburg to play host to Alfredsson and his teammates. "I think to get any NHL team over here to come and play is a great thing," Dahlen told NHL.com. "When you add that aspect that Daniel Alfredsson is home, that makes it even more special." Joakim Andersson, a third-round pick of Detroit in 2007, is a young player in the Frolunda system. He is seeing regular ice time with the Indians this season and hopes to join the NHL in the next few years. During his time with Frolunda, Andersson has heard about the legend of Alfredsson, a player who went to North America and forged his own fame and fortune through hard work. He is an inspiration for virtually every player that pulls on a Frolunda sweater. "We have all heard about Daniel," Andersson told NHL.com, "and we know what he has done. A lot of us have seen him when he played here a few years ago (during the work stoppage) and the excitement about him coming here is starting to build. "We have regular-season games to worry about, but there is no denying that, when the time comes, everyone will be excited.” Nobody more excited than Alfredsson, though. Frolunda was his life for so many years. He went to Burgarden Gymnasium, the local high school, and looked across the street at Frolunda's home rink every day. Several mornings a week he went there to skate before school. He spent countless hours at the practice rink, a subterranean setup that Frolunda players call "The Bunker." He heard the partisan crowd sing songs in his honor and celebrate his exploits. He laid the foundation for the hockey player – and the man – he is today in that rink. Now, he gets to repay at least part of that debt to his city. "I skated in that rink for years, twice each week in the mornings while I went to school across the street," Alfredsson told NHL.com. "So I have a lot of memories going back to that. To be able to play a game in front of the home crowd, I think it will be a special night." A night so special that the mere thought of it can even chase away any apprehension about the brave new world – without Spezza and Heatley – awaiting him when Alfredsson returns to North America for the rest of the season.